Disneyland is always full of magic, fun and memories that you’ll cherish forever. However, probably my favorite part about Disneyland is getting to enjoy all of the sweet treats. There is something about the food that truly makes it the Happiest Place on Earth. Because of this, I’ve created a guide of the best snacks at the Disneyland Resort, so you can satisfy your sweet tooth the next time you visit. If you’re planning a Disneyland vacation, make sure you book with Get Away Today. They offer the best price and best service, guaranteed. Not only will you be able to get discount Disneyland tickets from them, but you can also take advantage of their incredible hotel deals. 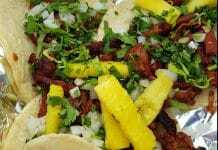 Since they have been partnered with hotels in the Anaheim area for over 28 years, you can get exclusive offers like free-night specials, complimentary breakfast and more. By saving so much money on hotel and tickets, you’ll be able to treat yourself to even more delicious snacks. Keep reading to get a promo code for your next Disneyland vacation package, exclusively for Utah Valley Moms readers. You can get the Raspberry Rose Macaron at the Jolly Holiday Bakery Café, which is located just at the end of Main Street U.S.A. This delectable treat is an adorable pink, Mickey shaped treat with raspberry filling sandwiched between actual raspberries to give it an extra special flair. While this macaron can easily be shared between multiple people, I would suggest treating yourself to your own because it’s just that good. Be warned, you won’t ever go to Disneyland again without eating this treat once you have it. 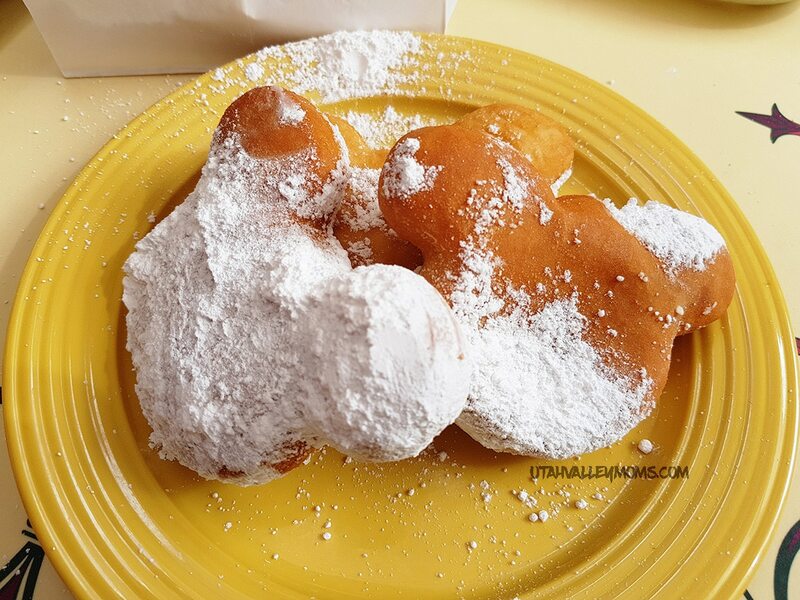 The Mint Julep and Mickey Shaped Beignets have become a classic Disneyland treat and it’s no surprise. This is the perfect snack to have on a hot summer day and need a quick break from all of the attractions. Plus if you visit during the holiday celebrations at Disneyland, you’ll want to make sure you try the seasonal Mickey Shaped Beignets. While they release a different flavor each year, they have had peppermint, pumpkin and butterscotch in the past. However if you’re looking for a more savory snack at Café Orleans, make sure you try their Pommes Frites. These traditional French-fried potatoes are tossed with parmesan, garlic and parsley. I promise you won’t regret it. Bengal Barbecue is a hidden gem located in Adventureland, right-across the way from Indiana Jones Adventure. While they have a variety of “jungle” skewers that include beef, chicken or vegetables, my absolute favorite skewer to get is the Safari Skewer. This skewer has asparagus wrapped in crispy bacon and is truly what dreams are made of. So the next time you get off of Indiana Jones, make sure you stop at Bengal Barbecue. Of course, most of you are probably aware of Dole Whips, but how could I not mention these delicious treats? At the Enchanted Tiki Room, you can order the legendary frozen treat known as the Dole Whip. This delectable concoction is a pineapple-flavored soft serve dessert that will change your life forever. As a tip, you can avoid the long-line at the Tiki Juice Bar by entering the Enchanted Tiki Room and ordering one from the inside. What would a trip to Disneyland be if you didn’t have one (or three) churros? I have yet to find a churro better than those in Disneyland, so make sure you get one when you go. You can find churros at almost any food kiosk within the park, plus, they have specialty churros you can get in Downtown Disney at the California Churro Cart. Here, you can indulge in specialty churros like Fruity Pebbles, apple cinnamon, strawberry cheesecake and more. If you’ve never made a pit stop at the Cozy Cone Motel, you are missing out. This area has SO many savory and sweet treats to try, that you’ll need to find enough room to eat it all. However, my favorite item at the Cozy Cone has to be the Chili Cone Queso. This delicious snack is filled with chili, cheddar cheese and corn chips, all served in a hot bread cone. If you’re looking for a snack or a small lunch item, this is one you’ll want to get. Speaking of our favorite Route 66 spot, you’ll also want to try some of the flavored popcorn that they have available at the Cozy Cone Motel. Not only can you get traditional butter, but you can also try flavors like dill pickle, buffalo ranch, white cheddar, sriracha, pizza and garlic parmesan. The Cozy Cone Motel is one of the best spots for snacks in Disney California Adventure, so make sure you are in route to this spot the next time you go. If you’re looking for the most beautiful treat in Disneyland, the Lavender Lemonade at Schmoozies is definitely it. This beverage is not only delicious, but it comes with a “glowing” cube as well. This illuminates this refreshing drink, making it the perfect drink for a summer day at Disney California Adventure. The Mickey Shaped Sourdough Bread at the Pacific Wharf Café is a great snack for you to share with friends and family. This massive piece of sourdough bread is adorable because it looks like Mickey Mouse, and is delicious too. If you have a hungry group of people, this is the best snack to share. If you love chocolate and ice cream as much as I do, then you’ll love the Golden Gate Banana Split. This treat consists of vanilla, strawberry and Ghiradelli chocolate ice cream, topped with crushed pineapple, strawberry topping and handmade hot fudge with a banana, whipped cream, diced almonds and a cherry. If that description doesn’t make you want to go eat one right now, I’m not sure what will. The next time you’re at The Happiest Place on Earth, make sure to try all these treats to make your vacation even happier. To book your next Disneyland vacation, visit getawaytoday.com or call 855-GET-AWAY to speak to an agent directly. Plus, get an additional $10 off your vacation package when you use promo code UTValleyMoms. Make sure to mention that Utah Valley Moms sent you! 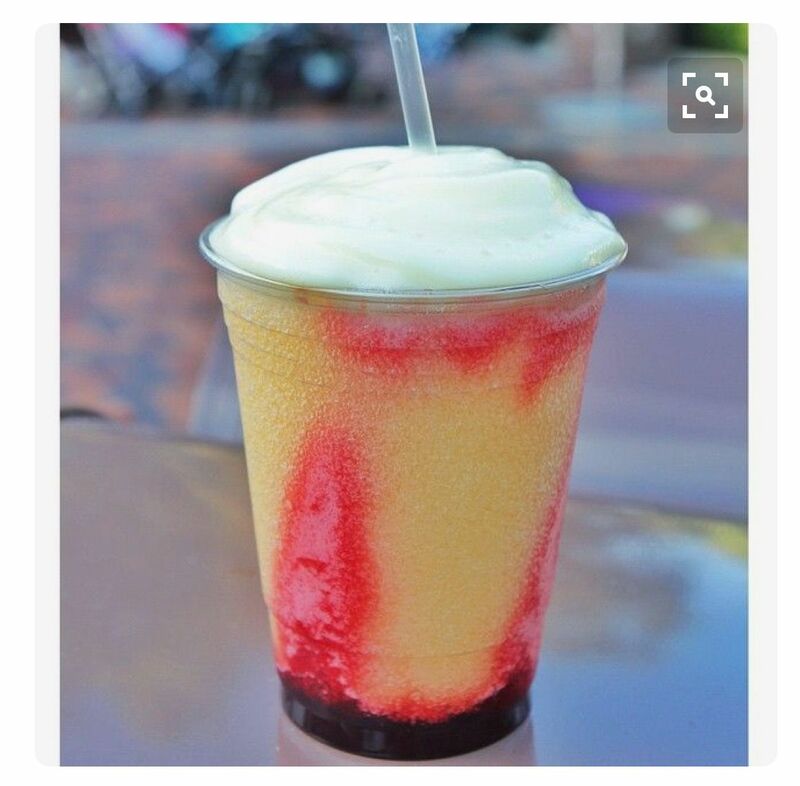 I would add the Boysen Apple Freeze (Regular $5.29) located at Maurice’s Treats Cart to the left of the castle. I’m not sure if you’d consider a drink a snack for this page, but I figured I’d throw it out there.